Trick-or-treating has ties to two Catholic holidays - All Saints' Day and All Souls' Day. One day is for honoring martyrs, and the other for praying for the dead. "Souling," a practice going as far back as the Middle Ages, is what trick-or-treating is based on. Children and the poor in Ireland and Great Britain would travel from door to door offering prayers and singing for the dead in exchange for soul cakes. A soul cake was an individual small round cake filled with sweet spices like allspice, cinnamon, nutmeg and ginger. Each time a cake was eaten, a soul was freed from Purgatory. In the United States, trick-or-treating for Halloween became popular in the 1950s. If a treat was not given when you knocked on a door, a mischievous trick or even vandalism was left behind. Today, over two-third of household in the United States give out candy to trick-or-treaters. Our favorite treat to give out are Pixy Stix Straw Candy. Besides being a fun day for kids, Halloween is one sweet holiday for the candy industry! Halloween is just around the corner, and you might be worried that your child is going to bring home a ton of unwanted candy from trick-or-treating. You might just want to tell your kid to get as much candy as possible this year! You can send it overseas to a soldier stationed in a foreign country like Afghanistan, and he or she can hand out the candy to the local children. There's a site called anysoldier.com that gives you a list of participating soldiers that would like to get care packages, and you can find a soldier who would love to get candy. This site gives you all the specifics, including do's and don'ts. Having your child give away their hard earned Halloween candy will instill a sense of pride and purpose in that they are doing something very generous for someone else. 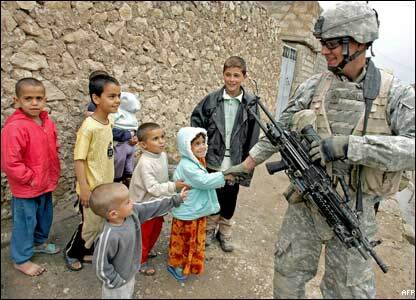 Giving treats to the local children builds trust between the soldiers and the locals and is a great way for them to build friendships as well. This year, collect as much Halloween candy as possible, and send it half way around the world! On October 15, 1951, exactly 60 years ago tonight, the first episode of "I Love Lucy" aired on CBS. It was called "The Girls Want to go to the Nightclub." The hit comedy starred Lucille Ball and her real life husband Desi Arnaz. I'm sure most Americans are familiar with "I Love Lucy" because it was hugely popular over the years, ran for 9 seasons, and today still continues to entertain one generation after another. It is one of those iconic shows that still makes everyone laugh. Even if you missed those 9 seasons way back when you can still watch reruns any day of the week on the Hallmark channel. The most watched episode ever was "Lucy Goes to the Hospital" for the birth of her son Ricky Jr. It coincided with the actual birth of her real son with the same name. My favorite episode is "Switching Jobs," also known as the Candy Factory episode. It has Lucy and Ethel working on a speeding conveyor belt wrapping chocolates. They can't keep up, so they stuff chocolate in their mouths, in their hats, and down their shirts. It's really, really funny. If you like this episode, you might like the I Love Lucy tin bank depicting the scene. "I Love Lucy" shows how every day situations can be turned into great comedy. Another fun episode is "Vitameatavegin," where Lucy wants to be in one of Ricky's tv commercials. She gets her way, but ends up having to taste the vitamin syrup with a high alcohol content over and over again. 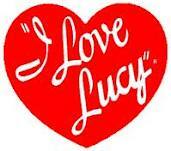 Happy 60th Anniversary to "I Love Lucy!" We wouldn't be the same without you! Sharing a bit of retro candy with a childhood friend is a great way to forget all your responsibilities for a little while and go back in time to when life was simple. It's amazing what a strip of Candy Buttons on Paper or some Pixy Stix can do for your psyche; it will make you feel like a kid all over again! 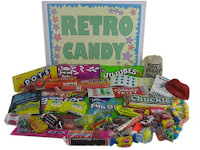 We all can use a little blast from the past now and again, and retro candy is a great way to get there. You might remember wearing a Candy Necklace when you were a kid, and how sticky your neck would get after you bit off a few of the candy beads. Your neck might even have turned a rainbow of colors from the candy dye settling on your skin. It's easy to relive that experience - all you need is the necklace and your old best friend to share in the fun. Somewhere in your past you must have had a bar of Bonomos Turkish Taffy that you froze and then took outside to crack into tiny pieces out on the road. A lot of parents today won't let their kids near a road, but when I was young we used to play in it! It's just as easy to smash the frozen taffy on your kitchen counter now that you're an adult. The candy will still melt in your mouth just like it did when you were a kid. Ah, the memories of retro candy! Other retro candies that might bring back good memories are Wax Bottles, Wax Lips, Fun Dip, Sugar Daddys, and Black Cows. Donckels Dark Chocolate Belgian Truffles are Back! It's a happy day for all of you chocoholics when Donckels Dark Chocolate Belgian Truffles arrive in the United States for the fall season! We have good news... they're back in stock at Woodstock Candy! These delicious truffles are available during cool weather here in New York, usually from October until February. Last year we stock piled them and had a supply through Valentine's Day. But once we run out, we won't have them available until the next year. So plan accordingly! 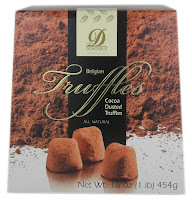 Donckels Chocolate Belgian Truffles make great presents during the Christmas holidays. Most people love chocolate, and because these truffles are imported from Belgium, they have a European flair. Umm, they are good. Donckels Chocolate Truffles actually melt in your mouth, if you can resist long enough without popping another one in. There are about 44 truffles in each pound box; plenty to share if you don't want to eat the whole lot yourself. Each bite sized truffle is rolled in cocoa, making it doubly chocolaty. Besides the joy that you get from eating chocolate, dark chocolate has health benefits as well. If eaten in moderation, it can lower your blood pressure, fight against heart disease, and protect against strokes. It is a natural antioxidant. Please don't feel guilty about indulging in a box of Donckels Chocolate Truffles. You deserve to feel great, and chocolate can help you get there!